In the six months since Women of the Gobi was published, I’ve spoken at my book launch and at a couple of writers festivals, and had one radio interview (Julie McCrossin for Qantas in-flight radio – she was lovely), and recently I addressed the senior assembly at Strathcona, the girl’s school I attended for the last two years of high school. Guess which was the scariest experience, by far? Teenage girls are terrifying. And none of them were even born when I was last there. Before I did the talk, I asked a few friends if they remembered being addressed by ‘old girls’ any time when they were at school, and my friend Bec told me a story that turned my blood cold. A former student talked to her Year 12 class about her life as a fashion model, and how she’d chucked it in to set up some worthy project in the third world, feeding orphans and suchlike. So there I was with a bunch of teenagers at 8.30 in the morning on a cold winter’s day, what an ideal audience. I thought I’d try to win them over with a few laughs, but I had absolutely no idea what teenage girls would find funny. I was up on the stage with a few teachers sitting behind me, and I could hear them laugh at my jokes, but I could hardly raise a titter from the girls, even when I cracked a killer line about Celine Dion. I don’t think the girls knew who she was. 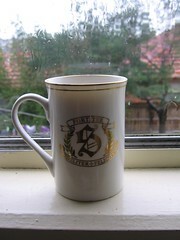 At the end of assembly the school captain presented me with a Strathcona mug. I was more excited about this than you might imagine, because it was the very first free thing I’d got as a result of being a published author. Swag! I went in to Lonely Planet to do some work later in the day, and I took my new mug up to the cafe and boasted about it to Pete the barrista while he poured a perfect long black into it. He looked at the gold rim. ‘Nice of them to give you a mug you can’t put in the dishwasher or microwave,’ he observed. You are currently browsing the KateJames.net blog archives for June, 2007.